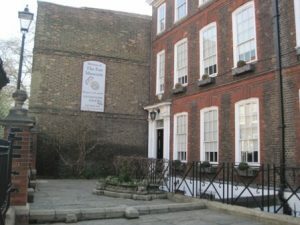 Housed in two Georgian town houses dating from 1720 in the Greenwich World Heritage Site, this is the most important collection of fans in the world. Behind the museum there is an elegant Orangery which serves afternoon tea and a Japanese style fan shaped formal garden with a pond and a stream. The museum has over 4,000 fans with the oldest dating from the 10th century. A selection of the fans is on show with the display changing 3 times a year. Exhibits include ivory fans, tortoiseshell fans, peacock feather fans, a fan with a built in ear trumpet and another fan with a built in repair kit. The museum also has a permanent display setting out the history of fans, the manufacture of fans and the different types of fans. As well as exhibiting fans, the museum also makes fans and holds fan making classes. It also repairs fans for other museums and for the general public. Full cream tea is served on Tuesday and Sunday afternoon with sittings at 2:15pm and 3:45pm – I am advised by the Museum that calling in advance to book is strongly recommended (tel. 020 8305 1441).